:: Do you hear what I hear? :: FOOD AND FORAGE: What color is your potato? Cover: Julie Sullivan will graduate next spring as the first organic major at Washington State University—first, in fact, in the nation. Read the story. Photo by Bruce Andre. 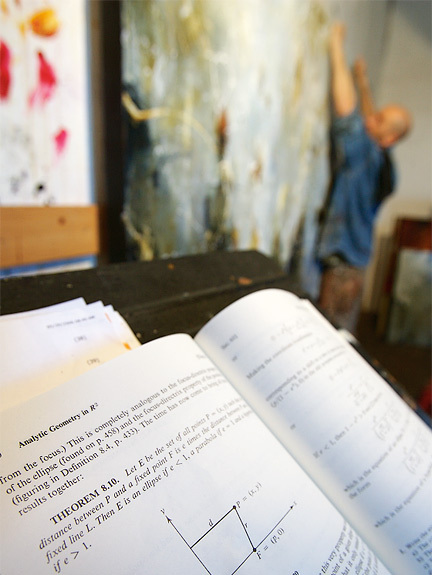 Math meets art in the paintings of Seattle artist Michael Schultheis. 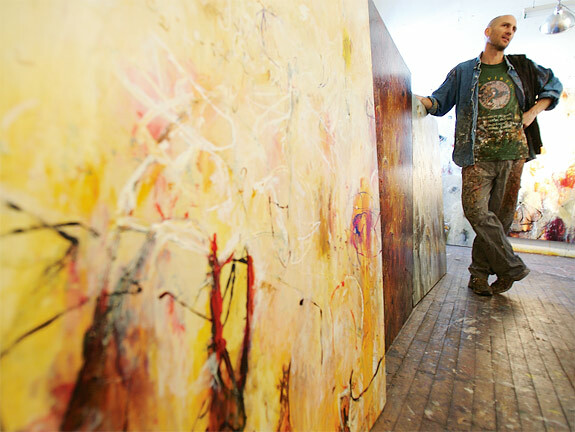 The 1990 WSU economics alumnus draws from 3equations and theorems in creating his layered, colorful pieces. 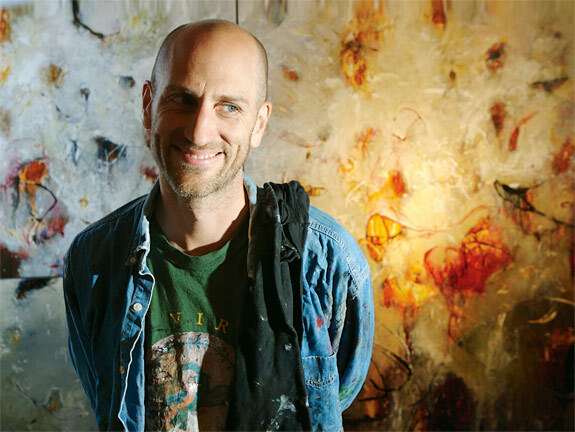 Michael Schultheis's efforts to blend art and math won him a solo exhibition at the National Academies in Washington, D.C. in 2005. 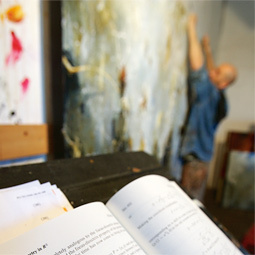 In his Ballard studio, Schultheis arranges canvases ready for a gallery show in New York City. His subjects include cycloids, paraboloids, lunes, and even riddles. Look closely, and you can see the equations as well as the physical shapes they represent. Drawing from his past as a math and economics student and software engineer, Schultheis starts with base colors like whit, representing a dry eraseboard, or black for a blackboard, and then layers on equations, movement, and color. Though his studio is not open to the public, Schultheis's work can be seen around the Puget Sound area. One piece hangs on the second floor of the Westin hotel in downtown Bellevue. He also has paintings at the Seattle Athletic Club, the Tacoma Art Museum, the University of Washington Medical Center, and the Winston Wachter Fine Art gallery in Seattle. The painter spends his days on the third floor of an ancient biscuit plant in a seedy section of industrial Ballard. The building, just a block from the Ballard Bridge, houses a collection of artists, mostly ceramicists whose main-floor kiln warms the warehouse through the winter. 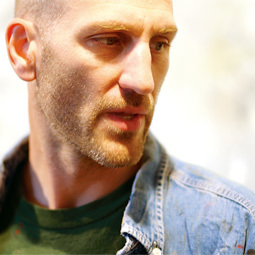 But acrylic paint is the medium for Michael Schultheis, 39. A climb up steep wooden stairs, and we're welcomed by Cesaria Evora's alto voice singing in Portuguese from a paint-spattered boom box. "Ah, she's wonderful," says a similarly paint-spattered Schultheis standing at the door to his bright studio. 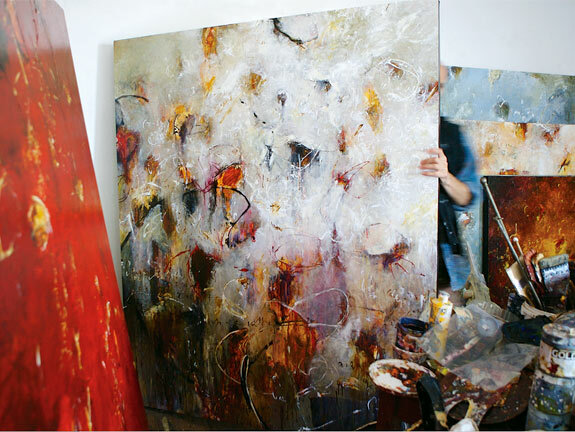 He is in the midst of creating paintings for a fall show at the Winston Wächter gallery in New York and a January show in Seattle. And as we start the interview, he spends the first 10 minutes moving canvases, hanging them in pairs and trios on the walls. "Just a little bit of gymnastics," he grunts. "I'm sorry. I should have done this before you came." We disagree. It's fun to watch him heave the large canvasses to their nails. The galleries want big paintings. Michael likes that. Their size allows him to interact with them in the same way he would a chalkboard. That is the first level of what he does—create a type of chalkboard. Then, drawing upon a past life as a software developer who has had to step up to the board and brainstorm, he writes on them. Years ago, he would have been part of a team mapping new programs on a dry eraseboard. Today he works alone, writing out theorems, mathematical equations, and geometric shapes on canvas. He may be alone in his studio, but in his head he shares the company of Euclid, Albrecht Dürer, and Galileo, translating their ideas to color and form in paint. Schultheis grew up on a wheat farm near Colton, about 12 miles south of Pullman. Impelled to Washington State University by a full-ride scholarship, he studied economics in the honors program. After graduation, he migrated west to find work. He also sought night classes in math at the University of Washington. He was accepted to Cornell for graduate school and, again on scholarship, studied there with plans of becoming a professor of labor economics. One of his favorite memories is of a statistics professor who would work out her equations on a chalkboard in front of the class. "She would start at one end of the board and go all the way across," he says. "Then she would go back and sort of erase and create a window through the math and write something new. You could . . . see the memory of the equation underneath. Then in her wonderful New Delhi accent, she would pound on the board and say, 'Isn't this beautiful? Isn't this elegant?'" Though he loved math and economics and was following his dream, something was amiss, and Schultheis struggled with insomnia. He tried a drink before bed, medicine, and finally found solace in a $2.99 watercolor paint set. 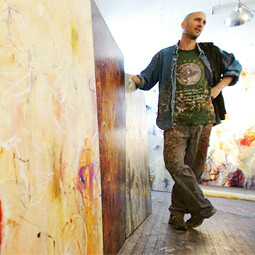 He kept painting after leaving Cornell with a master's degree to return west to work as a software engineer. He did it all: landscapes, portraits, oils, pencils, paints. But the genius idea of how to really capture his visions on canvas hit him as he was coming across the 520 bridge after work one night, listening to an artist on NPR. She said, quite simply, you have to paint what you know. He knew analytical math, economics, statistics. "So that's where I began." "You can see that's it's all related," he says. "Math has ties to art, music, dance. Everyone talks about left brain/right brain like we've all had a lobotomy." But math is music. A graph is art. "Einstein played the violin. Paul Klee was an insurance salesman," he says. "There is a wonderful embracing of it all." Schultheis left his day job a few years ago and started drawing on what he knew: the blackboard and the dry eraseboard. His early works were grey, white, and black. They had equations, and windows, and movement. A Seattle gallery started showing his work, and he was selling paintings and gaining positive reviews. 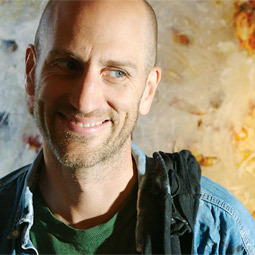 In 2005, he was commissioned to create a show for the National Academies—science, engineering, and medicine. 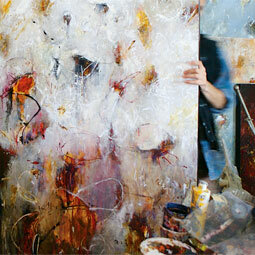 He added yet more dimensions to his work, following his curiosity into history and color palettes. Inspired by the Academies' auditorium, which has an acoustical ceiling composed of cycloid-shaped curves, he created a series of paintings based on the cycloid, its physical shape and its mathematical formula. He also researched the history of the cycloid, noting that Galileo was working on the equation in the late 1500s, at the same time a Ming Dynasty military general named Qi Jiguang was inventing a weapon, a wheel that emitted sparks in the same form as a cycloid. The palette in Qi Jiguang's official portrait was the inspiration for the colors Michael used in the cycloid series. The Academies exhibit opened with a black-tie reception and brought international attention in the often very separate worlds of arts and sciences. Schultheis was overwhelmed by the response. 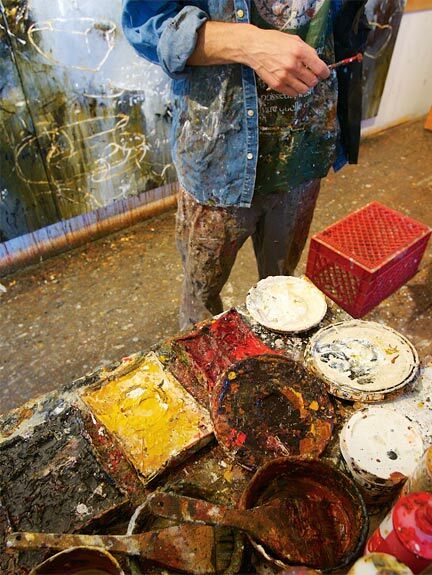 "These were all Nobel Laureates, and they were interested in my paintings," he says. While his work has an appeal for many, those who understand the equations can look at the letters and numbers and see the graphic visualization of those ideas. "It's like reading sheet music," he says. "Some people can look at it and hear the notes. People who know math can look at my paintings and see the shapes."